What Is the ‘Abomination of Desolation’? | TGC | The Gospel Coalition. In Mark 13:14 the sign for the disciples that the destruction of the temple is soon to happen is this ‘abomination that causes desolation’. This term appears 3 times in Daniel 9,11 & 12. In each case it is associated with the putting to an end the sacrifices – ie. the Temple itself will be desecrated, made unclean, so that it can no longer be used for worship, and is no longer a suitable house for God’s glorious presence. In 68AD, with tension between the Jews and Rome on a knife edge, the Zealots (Judas was a member of this group), who saw that the Kingdom of God would be brought in only when they rebelled against Rome and took Jerusalem by force, had the High priest and those loyal to him murdered, installed their own man ‘Phanni’ as High Priest, and turned the Temple into their fortress. The temple was filled with the blood of humans, and became a place of violence, drunkenness and immorality. 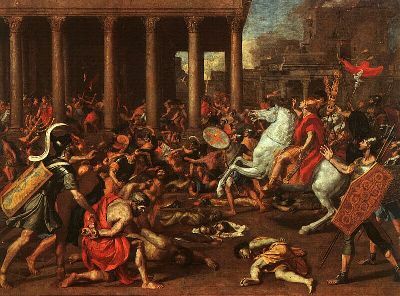 In response the Romans multiplied their armies, and literally surrounded Jerusalem, until in 70AD they besieged the city, slaughtering all they came across – men, women and children – and destroyed the Temple and all who were in it. They literally trampled Jerusalem underfoot. So I put it that the Abomination is not primarily the Romans, but the Zealots – those who themselves were Jews had brought desolation to their own Temple! This was not about Rome storing up judgement for herself; it was about the judgement that Jesus’ own people had already stored up for themselves by rejecting him as their Messiah. They should have recognised that their responsibility as God’s chosen people was to welcome the Messiah when he came; to recognise Him as the fulfilment, the ‘Yes’ to all of God’s promises to bless them and to make them a blessing to the Nations; yet they forsook this commission, wanting to keep all of God’s blessing for themselves, and cut themselves off from and despised the nations. This is the ‘time of the Gentiles’ that Jesus speaks of here (24). The old system of the Temple with all its rituals; the city, nation and people of the Jews, has been brought to an end because now the Gospel is going out not just to Jews by to every tribe and people and tongue and nation.